​Place lentils in a large saucepan and cover with cold water. Bring to a boil. Strain lentils and place back in pot. Add carrots, onion, clove, bay leaf, broth, and a teaspoon of salt. Bring to a boil then reduce heat and simmer until lentils are tender, about 25 minutes. Drain pot. 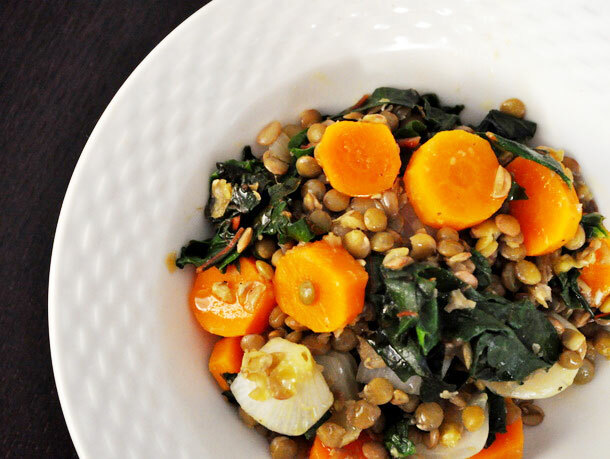 Place lentils and vegetables in a large bowl. Discard clove and bay leaf. Season to taste with pepper and more salt. In a medium saute pan, heat olive oil over medium heat until shimmering. Add kale and cook, stirring frequently, until starting to tenderize, 3 to 4 minutes. Add garlic and cook, stirring constantly until fragrant, about 30 seconds. Season to taste with salt and pepper and add to lentils.